Which Incentives Would Employees Choose If They Could? From free gourmet food and bring in your pet day, to napping pods and haircuts on site; companies like Google offer a variety of incentives and benefits to employees. Unsurprisingly, Google hold a rating of 4.4/5 on Glassdoor, with 92% of its employees stating that they would recommend the company to a friend. Many organisations struggle with attracting and retaining suitable staff. With the nature of today’s competitive job market, companies have to pull out all the stops in order to attract the highest calibre candidates. I think it’s important to offer incentives and benefits to employees to show them you appreciate their work. I like to keep my staff on their toes; maintaining the thirst to learn and achieve, while ensuring there is never a dull moment. I take my staff boxing training with an ex-European champion every Friday, even giving them the chance to “hit the boss”, which has proven popular! I recently organised a competition; the prize being a flying lesson. I noticed the difference it made with motivation levels and when meeting targets. Reboot conducted a survey of 1,200 marketing professionals on the benefits they are being offered at work and what their top 3 work benefits would be, if they could choose. 66% stated their company offers some form of benefits/ incentives. 70% of employees say it makes a difference to their motivation at work, and job retention. 25% would take one job over another because it offers more/ better incentives. 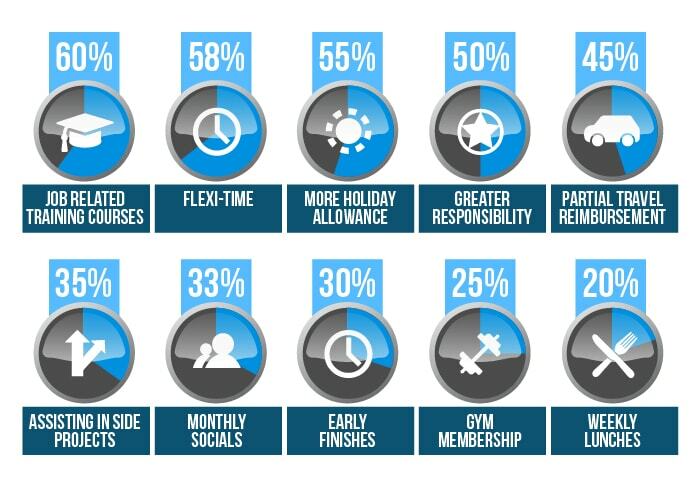 The most popular benefits were related to job progression and flexible hours, with the provision of training wanted by 60% of respondents, followed by flexi-time (58%) and more holiday allowance (55%). Sometimes the little things make all the difference. Fresh coffee, drinks after work, gifts on birthdays – my old company made a real effort with all of those and it made a difference. We were also offered a half Friday every 6 weeks. Some companies may not be able to but think about what would make a difference to you. Put yourself in others shoes. I would also suggest asking around, if you can, to what perks and incentives would be of interest to your employers. Perhaps a few ideas could be put forward and you can then decide what is possible. Can you combine an activity or team building day with some perks? A day trip somewhere nice or a working lunch or dinner that both employer and employee can benefit from? When it comes to work perks, it can seem farcical to point out the obvious: they make employees happy. But, as good bosses know, happy employees work harder, stay longer, and are more productive overall. Millennials, who are constantly assailed by media claims that they are ‘lazy’ or ‘entitled’, tend to be particularly receptive to work perks precisely because they indicate that both they and their contributions are valued. At the end of the day, our job consumes an awful lot of our time and effort, and it’s important to our morale to feel that our company appreciates that. Allowing staff to work flexibly in ways that suits them, or rewarding them for high performances, are cheap, easy ways for companies to incentivise their employees to be the best workers they can be. Getting the right incentives or perks for your staff can also help you attract the right talent. What you can afford in terms of value for money and the ROI you get for it is something you will have to weigh up. Countless studies have shown that the benefits of offering good staff incentives will always reap good rewards in the long run – as long as you offer what employees actually want, not what you think looks good on paper.